Mechanical watches are great in that they never need batteries, but they are simultaneously less than great in that they will lose time if not worn or otherwise regularly agitated. The ridiculous solution to this is the watch winder, which automatically rotates your mechanical watches for you, while you’re not wearing them. This is probably the item you’ll miss the least once the apocalypse hits. [Kristopher] wanted a nice quiet watch winder for his bedside table, but existing solutions were either too loud or too expensive. As is often the case, hacking ensued. [Kristopher] had decided that starting from scratch was too much hassle. The cheaper watch winders on the market had acceptable quality enclosures, but were simply too loud. [Kristopher] sourced a $40 unit from Amazon, and proceeded to gut the drivetrain. This was replaced with a Sparkfun stepper motor and a Trinamic SilentStepStick – an advanced stepper motor driver that uses several techniques to reduce noise during operation. An Arduino Nano was substituted as the brains of the operation, communicating with the stepper driver and allowing the winder to be configured for different wind rates. [Kristopher] reports that the device operates near-silently, and the total cost came in well below that of a high-end luxury winder. Mechanical watches don’t always get a lot of attention these days, but we’ve seen one built from the ground up before. As always, with tips – send ’em if you got ’em. Can You Trust Your C Compiler? If you are writing a hello world program, you probably aren’t too concerned about how the compiler translates your source code to machine code. However, if your code runs on something that people’s lives depend on, you will want to be a bit pickier and use something like the COMPCERT compiler. It’s a formally verified compiler, meaning there is a mathematical proof that what you write in C will be correctly translated to machine code. The compiler can generate for PowerPC, ARM, RISC-V, and x86, accepting a subset of ISO C 99 with a few extensions. While it doesn’t produce code that runs as fast as gcc, you can be sure the generated code will do what you asked it to do. Of course, this still provides no assurance that your code will work. It just means that if you write something such as “x=0;” the generated code will set x to zero and will not do anything else. You can apply formal methods to verify your source code and be assured that the compiler doesn’t introduce possible failures. Cases where code like “x=0;” does extra things or incorrect things are very hard to figure out because the source code is correct and an examination of the generated code would be necessary to find the compiler’s code generation bug. When you think about all the forces that have to be balanced to keep a drone stable, it’s a wonder that the contraptions stay in the air at all. And when the only option for producing those forces is blowing around more or less air it’s natural to start looking for other, perhaps better ways to achieve flight control. Taking a cue from the spacecraft industry, [Tom Stanton] decided to explore reaction wheels for controlling drones. The idea is simple – put a pair of relatively massive motorized wheels at right angles to each other on a drone, and use the forces they produce when they accelerate to control the drone’s pitch and roll. [Tom]’s video below gives a long and clear explanation of the physics involved before getting to the build, which results in an ungainly craft a little reminiscent of a lunar lander. The drone actually manages a few short, somewhat stable flights, but in general the reaction wheels don’t seem to be up to the task. [Tom] chalks this up to the fact that he’s using the current draw of each reaction wheel motor as a measure of its torque, which is not exactly correct for all situations. He suggests that motors with encoders might do a better job, but by the end of the video the little drone isn’t exactly in shape for continued experimentation. Of course, dodgy reaction wheels don’t only cause problems with drones. They can also be a problem for spacecraft when the Sun gets fussy too. Let’s not pretend we aren’t all guilty of it: at some point we’ve all connected to a public WiFi network to check our email or log into some site or service. We know the risks, we know better. But in a weak moment we can let the convenience of that public network get the better of us. What if you had a small secure router that you could use as an encrypted VPN endpoint, allowing you to connect to those enticing public networks while keeping your traffic secure? 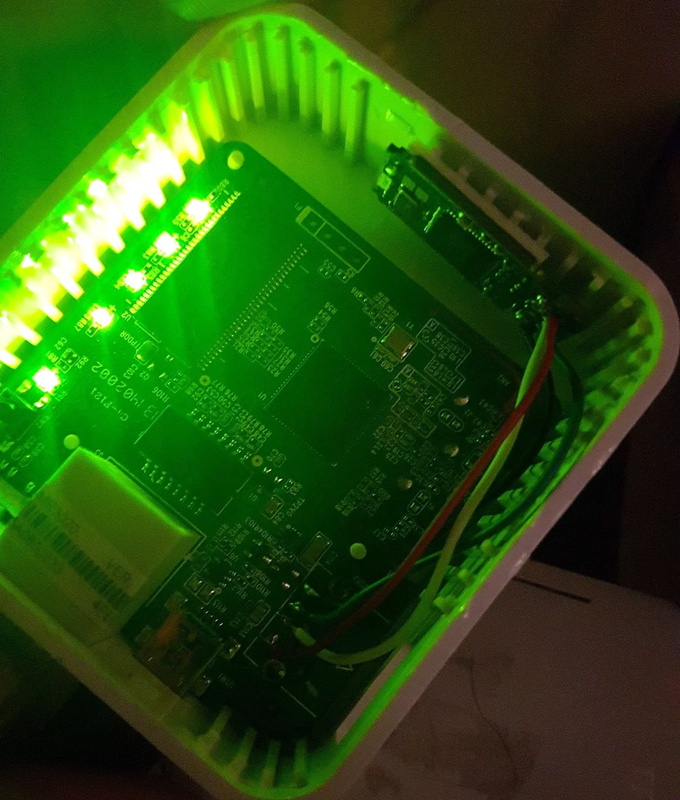 That’s precisely what [David] had in mind when he built this pint-sized solar-powered OpenWRT router. At the heart of this gadget is the TP-Link TL-MR3020, a tiny OpenWRT-compatible router that’s no stranger to the pages of Hackaday. Its small size and low cost have made it a natural choice for a wide array of projects, so it’s little surprise that [David] gravitated towards it. But simply getting OpenWRT installed on the MR3020 and configuring OpenVPN doesn’t exactly grant you entrance into the Hackaday Pantheon, so obviously there’s a bit more to the story. For one, [David] didn’t like the idea of a USB flash drive hanging out of the side of his router. Since the flash drive would essentially be a permanent part of the router, as it is being used to expand the rather meager internal storage of the MR3020 he decided to wack the USB end off the flash drive and solder it directly to the router’s PCB. This gave him a much cleaner looking package, but it still wasn’t as portable as he’d like. He decided to order a solar-charged USB power bank to become the new home of his hacked MR3020. He kept the solar panel and charge controller from the original gadget, and after some researched settled on a pair of LG-HG2 3000 mAh batteries as the power source. [David] went through a few charge and discharge cycles making sure everything worked as expected before buttoning up the case. In the future he says he might transplant the electronics into a 3D printed case, but for now he’s pretty pleased with the results. If you’d like to try your hand at hacking these popular micro routers, you’ll need to start with an OpenWRT firmware. After you’ve got a full blown Linux distro running on this little fellow, the only limitation is your own imagination. Writing this in the frigid darkness of a Northern Hemisphere January evening, I have to admit to more than a little envy of Samy Kamkar and his friends. One of their summer events is a private party at a secluded campground somewhere that looks quite warm, which from here seems mighty attractive. Samy wanted to provide a spectacle for his friends. What he came up with is glowing orbs; LED balloons that would float above the campsite and wow his friends with their pretty synchronised illumination. Thus an adventure in wireless communications, lighter-than-air flammable gasses versus electronics weight calculations, and code optimization began, the details of which were shared in Samy Kamkar’s 2018 Hackaday Superconference talk embedded below. The original Xbox launched way back in 2001, to much fanfare. This was Microsoft’s big first entry into the console market, with a machine packing a Pentium III CPU, and commodity PC hardware, contributing significantly to its bulk. Modding was a major part of the early Xbox scene, and as the original hardware has grown too feeble to keep up with modern tasks, enterprising makers have instead turned to packing the black box with modern hardware. The team at [Linus Tech Tips] decided that other builds out there weren’t serious enough, and decided to take things up a notch. The build starts with a passively cooled compact power supply, a Core i5 8400 6-core CPU, and a GeForce RTX2070 to handle graphical tasks. Parts were carefully selected for a combination of performance, packaging, and with an eye to the thermal limits inherent in stuffing high-powered modern hardware into a tight Xbox shell. All manner of oddball techniques are used to make the build happen. The GPU is connected through a PCI Express cable, which we were surprised to learn was a thing, given the nature of high-speed signals and long transmission lines. The Xbox shell had its original metal insert and plastic standoffs removed, with an aluminium inner shell being CNC cut and bent up on a pan brake to act as a new internal chassis. There’s yet more carnage to come, as the GPU has its extraneous DVI port hacked off with a grinding wheel. In the end, after much cutting and cajoling, the parts come together and fit inside the case, making the sleeper build a reality. It’s fun to watch the team fiddle with config files and struggle to load and play local multiplayer games, as they realise that there are just some things that consoles do better. Regardless, it’s an impressive casemod that goes to show what you can pull off with some off-the-shelf parts, a well-stocked workshop, and some ingenuity. If you’re looking for more case mod inspiration, try out this all-in-one printer build. Video after the break. Designing circuit boards for high speed applications requires special considerations. This you already know, but what exactly do you need to do differently from common board layout? Building on where I left off discussing impedance in 2 layer Printed Circuit Board (PCB) designs, I wanted to start talking about high speed design techniques as they relate to PCBs. This is the world of multi-layer PCBs and where the impedance of both the Power Delivery Network (PDN) and the integrity of the signals themselves (Signal Integrity or SI) become very important factors. I put together a few board designs to test out different situations that affect high speed signals. You’ve likely heard of vias and traces laid out at right angles having an impact. But have you considered how the glass fabric weave in the board itself impacts a design? In this video I grabbed some of my fanciest test equipment and put these design assumptions to the test. Have a look and then join me after the break for more details on what went into this! Goran Mahovlic wrote a comment on ulx3s . Randy Elwin liked LedCade - µ arcade game cabinet.